Anyway… now that some of you have been making your own cards, lets take a look at different ways to design cards; Top-Down and Mechanic. It’s pretty simple concept; simple enough that this is what Wizards used for “You Make the Card 2” which lead to Crucible of Worlds. If you’re too lazy to click on that link, just keep reading. 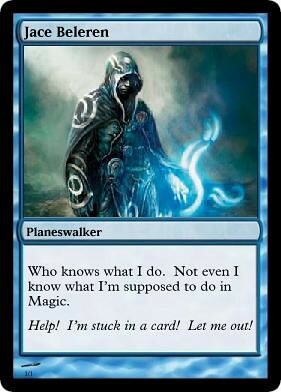 First: I won’t comment on the new official card type: Planeswalkers. Only because we have no idea what it does. There’s been plenty of ideas that have been thrown around about what it could do. But until we “officially” know, I can’t say anything. I’m actually saying this for all spoiled cards: No comment until we see a sanctioned spoil. That means, it comes from Wizards, a magazine, or another web site that has a scan. It’s only fair to people who aren’t trying to be spoiled before the prerelease, and so we don’t get any information wrong. Let’s say you want to create a card based on on this movie you saw. You’re like “Wow, that would be a really cool card.” Now, replace movie with book/TV show, RPG character/comic book character/part of your story in your set(s). You’ve got the top down design. The card is based on flavor (on whatever you want) and you have to figure out how it works. To the left is something I pull out of cards I designed. I design alot of my top down cards on movies. Why? I’m a movie buff (see my movie blog (shameless plug)), layoff me. 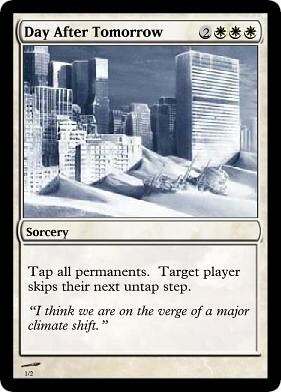 If you haven’t seen The Day After Tomorrow, basically a storm comes in and creates a second Ice Age. From the creators of that new Godzilla movie. So, this card mimics the “storm” (not the mechanic). I just wanted to show you that not all top down cards are lands, creatures or artifacts (which is what alot of people only think when they do top-down cards). Have you ever wanted Magic to do something, like something really cool or simple that R&D hasn’t done? Yeah? You’re designing a mechanic. Not so hard, is it? Now, this is not a dealing with Keywords (which we’ll get to that eventually). This is something that you would actually see in a card that could almost fit on any plane (depending on what the card does obviously). These range all over the place from the simple to the complex. As you can see to the right, I used the tribal element of Elves to give them a little more power in drawing. It can fit in Green’s piece of the Color Pie since their drawing comes from animals. At the moment, again,don’t worry about creating too powerful or too narrow cards. We haven’t even gotten close to worry about all that yet. The names, flavor text and art doesn’t have to be top notch, these are just drafts. If you want, add our MySpace account (myspace.com/mtgcolorpie), and post a top down and a mechanic card of your choice that you’ve created. Let’s see how creative this community is. Join me Tuesday when I talk to MaRo. From my computer. Where he’s probably not going to read it. Everything I do for him and he’s not even paying attention! No I’m not stalking, why would you think that?